No one wants a damaged smile. From missing teeth to decay and disease, there are many factors that can affect the health of your smile. Your natural teeth are the best component for your smile, so we believe in restoring the teeth you were born with whenever possible. Carnazza Dental Medicine offers restorative dentistry services to rehabilitate your smile and ensure your mouth is always functioning properly. If your mouth isn’t working like it should, the way you eat, bite, and speak can be negatively affected. To maximize your oral health, we’ll check all the parts of your smile to make sure they are all cooperating with one another in harmony. Restorative dentistry isn’t just focused on the functionality of your smile. You need to love the way your smile looks, too, which is why every restoration we perform is as close to natural as possible. From using tooth-colored materials that match the shade of your enamel perfectly, to prosthetic replacements that are undetectable, Dr. Carnazza understands the true balance of aesthetic and functionality, and it shows in every restoration he performs. We’ll be there during each step of the restoration process, so you can get the care you deserve from the doctor and team that you trust. You’ll always see Dr. Guy Carnazza – there’s no need to worry that the doctor you see will know your progress. We’ll show you how to care for your restoration, so you can enjoy your new smile for years. Once decay has struck, it’s important to intervene as soon as possible. Decay that isn’t treated can become a big problem, leading to infection, disease and over time, even tooth loss. Don’t let decay take control of your smile. Call us today and rediscover the beautiful smile as nature intended it. Is your smile functioning properly? Schedule an appointment to find out today! Don’t worry if you discover you need a dental filling – you’re not alone. Fillings are the most common dental restoration performed. It’s a simple and generally quick procedure, where Dr. Carnazza removes the decayed portion of the tooth, and fills it with a tooth-colored composite resin. Once the filling has cured, you’ll be able to resume normal use of your teeth, eating, drinking, and speaking like normal, without irritation from decay. We’ll keep you relaxed and free of discomfort throughout the whole process. In some cases, your teeth may not be able to accept a traditional composite filling. This can be due to moderate decay that covers a wide portion of the tooth. For these situations, we recommend porcelain inlay or onlay restorations. Inlays cover the biting surface of the tooth inside the cusps, while onlays extend over the cusps. Both restorations are more structurally sound than large composite fillings, and generally don’t require an additional crown for support. Dental crowns are another common restoration, and are little “caps” that cover the area of the tooth above the gum line. Crowns help to stabilize teeth that have been damaged, weakened, or received endodontic therapy. Our crowns are created from an impression of your tooth, so it fits perfectly, and the ceramic is custom-matched to the shade of your natural teeth. Dental crowns are also used to complete a dental implant, or to anchor prosthetic teeth in a dental bridge. Crowns look natural and feel just like your regular teeth. If you’re missing a tooth or a series of teeth, dental bridges are just one option for replacement. These fixed prosthetics use dental crowns anchored on the healthy teeth on each side of the gap. Generally, dental bridges are an affordable solution to missing teeth, and help restore the aesthetic of your smile. We use either porcelain-fused-to-metal or metal-free dental bridges, depending on the specific case. We provide a seamless restoration that blends with your natural teeth perfectly. Patients who are missing teeth may consider partials or dentures as a replacement option. Partials are right for patients who have some healthy teeth remaining, and need to stop the teeth from shifting. We create a natural looking prosthetic to fill in the gap created by the missing teeth. Partials are removable, and are held in place by metal clasps. Dentures are for patients who have lost an entire arch of teeth. Our dentures can restore your confidence and are always aesthetically-pleasing. Secured with natural suction or adhesive, we’ll custom fit you for the right set of dentures to ensure maximum comfort. You’ll love your beautiful, full smile. Dental implants are the closest to natural replacement option for missing teeth, and they promote your oral health in the process. Whether you need to replace a single tooth or a series of teeth, dental implants look and feel natural, and are extremely durable when taken care of properly. 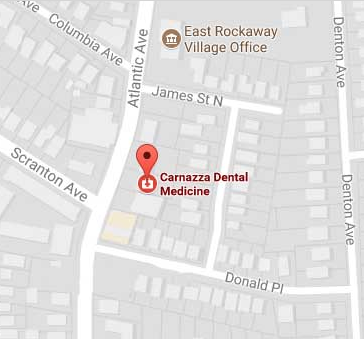 Dr. Carnazza is the only local dentist who can both place and restore dental implants, making him the best choice for your tooth replacement. For more information visit our Implant Dentistry page. Root canal procedures don’t have the best reputation. However, they can actually help save your natural teeth when decay has caused an infection in the pulp. Endodontic therapy is the process of removing the diseased pulp, and restoring health to your tooth. And don’t believe what you may have heard about root canals. With our compassionate team in control of your care, you can rest assured you’re always in good hands We perform anterior or premolar root canals in our office, and are happy to refer you to a specialist for more advanced cases. Sometimes, you need to have a tooth removed. When teeth have taken too much damage or are too weakened from disease, the best option for your oral health is extraction. It’s okay. With us, you’ll get the most patient-focused care from the team you’ve come to trust. No matter how minor your surgery, we’ll do everything we can to make sure your needs are met and you are comfortable throughout. We’ll thoroughly explain post-op care and answer any questions you have at any point during the process. Whether it’s a minor extraction or wisdom teeth, we perform extractions from the comfort of our office.